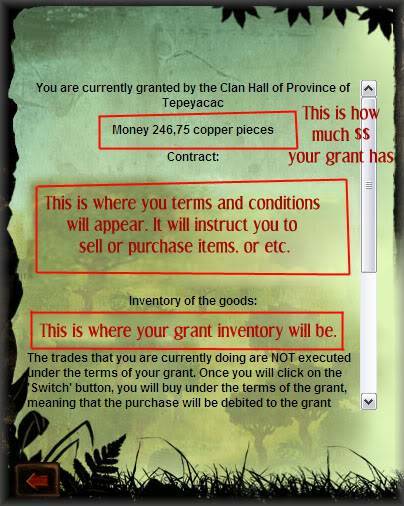 A grant is something your Clan Chief, Tribe Trade Minister or Tribe Sheriff may give to you. 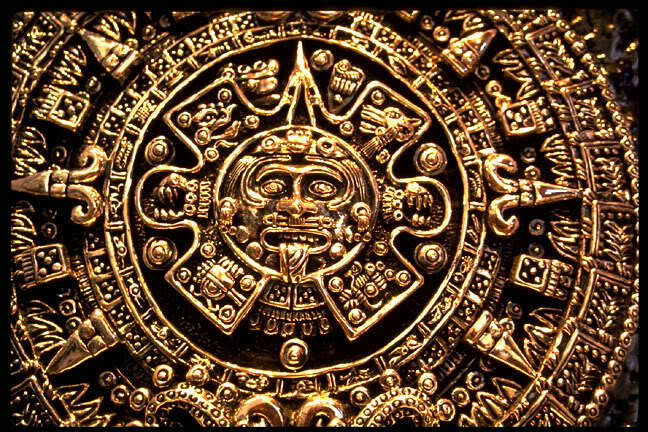 It is like a contract between to parties, often involving goods or coppers as well as purchasing or selling on either end. Terms and conditions are written within each grant and grant holders must abide by them or face punishment. Grants are safe from robbery and clan hall revolts, but can be called back should an army take over your clan. To protect grants from an army, grant holders must be out of their clan. 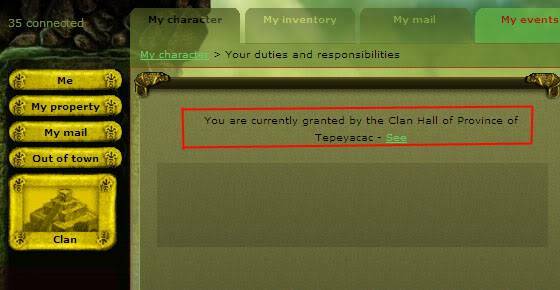 Grants issued by the Clan Chief can only be canceled (returned) when grant holder is back within the clan. 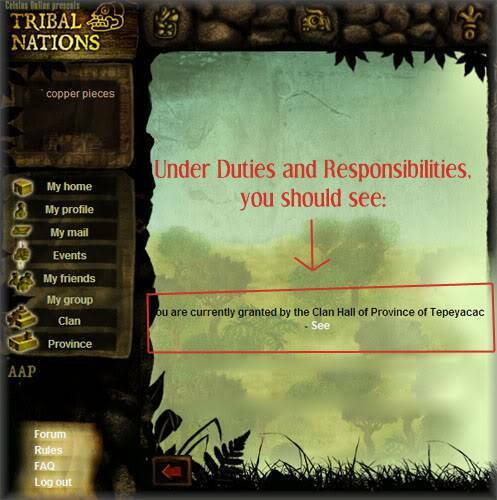 Grants issued by the Tribe Trade Minister or Tribe Sheriff may be returned anytime. 2. Must be honest and disciplined: Grant holders must abide by the terms and conditions written within the grant. That is a contract – should the grant holder betray that trust, they will be punished. If you click ’See’, the grant page will open. 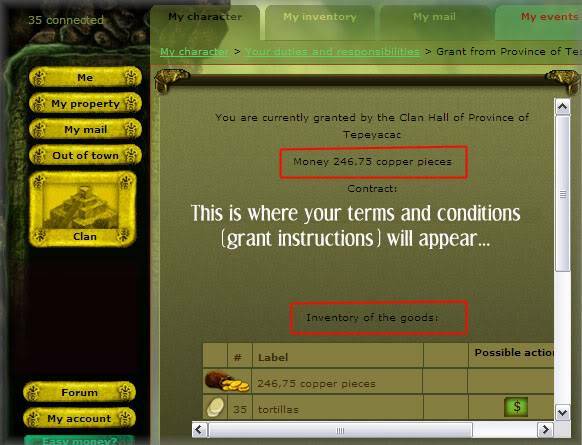 Inside the grant page will be the details of your contract (your terms and conditions) and essentially instructions on what you must do with the grant. A grant is simply a bank account on the side (basically someone elses’ purse in which you can put stuff in or take stuff out of, but it’s not your own). 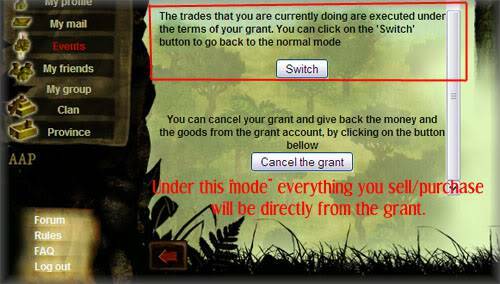 Once you have ’Switch’ the grant on, everything you buy will be with the grant money and the purchase will go inside the grant inventory. 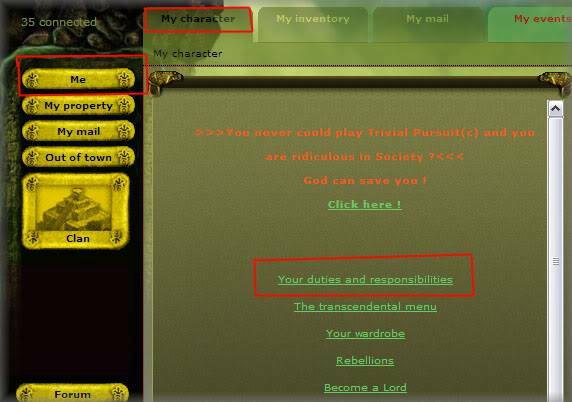 Your personal inventory/money will not be used. 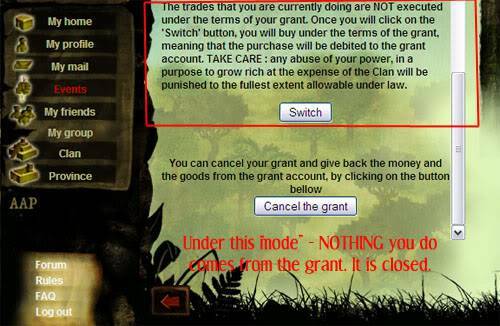 To cancel a grant from the Clan Chief, you must be in the same Clan before you click the cancel button. 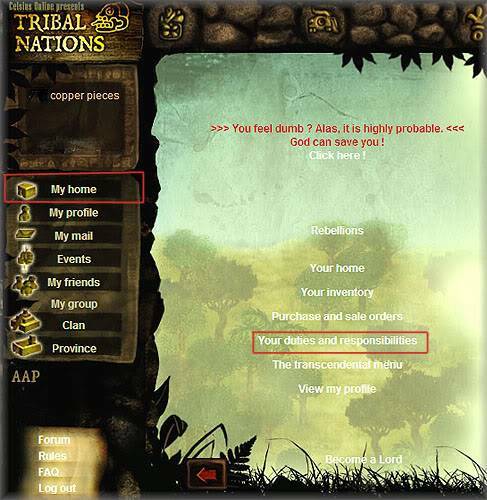 You may cancel a grant from the Tribe anytime. This is a guide that will explain the points of transferring money with grants and using them to safeguard goods while travel. Any goods or money stored within a grant are unable to be stolen in a robbery, same with any equipped. The standard grant tends to have a piece of wood, at least to my knowledge, so this will be the example we use. To start out, you'll find a grant with nothing other than a piece of wood in it. You need to first transfer money in before you can transfer goods in. So, to start out we put it up at 15c. If there is wood up for that, you simple put up at say, 15.05c, so you don't buy anything else instead. Next you head to the market and purchase the wood yourself. Just go and buy it like normal, wait a few minutes, and viola, you have a piece of wood and the grant has 15c in it. Now this is all fine and dandy, but you need to have that wood back in to transfer more money. Let's say the current wood sale are 5c 5.60c and 6c. We want to maximize how much we transfer each go, so if we believe no one will buy it in a mass wood buyout, we put it up for say 5.1c. Now we head to duties and responsibilities>grant, and click the switch button once, we are now buying with the money in the grant. Go to the market and purchase the piece of wood. After the sale goes through, you now have 9.9c and one piece of wood in the grant. Congratulations. Now, all you need to do is to continue transferring this way, if you have the spare money both in the grant and yourself, you can purchase more goods to use in the transfer to speed it up. In the long run, travel grant transfers tend to be a long and troublesome process, but worth it when that thief comes away no richer after the fight. To transfer money out of the grant, you simply have to sell for a high price to the grant, and buy for low, the exact reverse. To make sure you have something to sale, you should travel with a shaft equipped, since equipped items don't get stolen. This is also how you transfer money out of loan grants also.